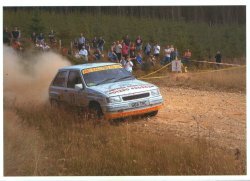 The event started and finished in Elgin and consisted of eight special stages. The first two stages were round Cooper Park in Elgin town centre. The first went OK but on the second run the car clipped a kerb damaging a wheel and costing a few seconds. The remainder of the rally was held on the fast smooth forests around Speyside. Stages 3 and 4 went well with the team setting fastest time in class in both to open out a healthy lead. We then had a service halt which was fairly routine with no dramas. Stage 5 was next and at 15 miles was the longest of the event. Everyhting was going well until about two miles from the end when the car went over a bump and the engine cut out. Gordon tried to find the problem while Ian went back down the stage to warn approaching cars as we were stopped on a blind bend. The problem was traced to a faulty connection on the ignition coil which Gordon was able to repair but around 11 minutes were lost in total costing us any chance of a victory. We had another service halt straight after the long stage and we were able to fully repair the electrical connection to let us get through the rest of the day. The last three stages went well and we were able to set fastest time in class on all three without having to take any risks. After setting 6 fastest class times from eight stages it was disappointing to drop to fourth after the electical problems in stage 5. However the important thing for the team was to get to the end of the event to win the 1300 championship and class 2 in the Scottish Championship which more than made up for failing to win the event. Photo courtesy of 63 Car Club Elgin.